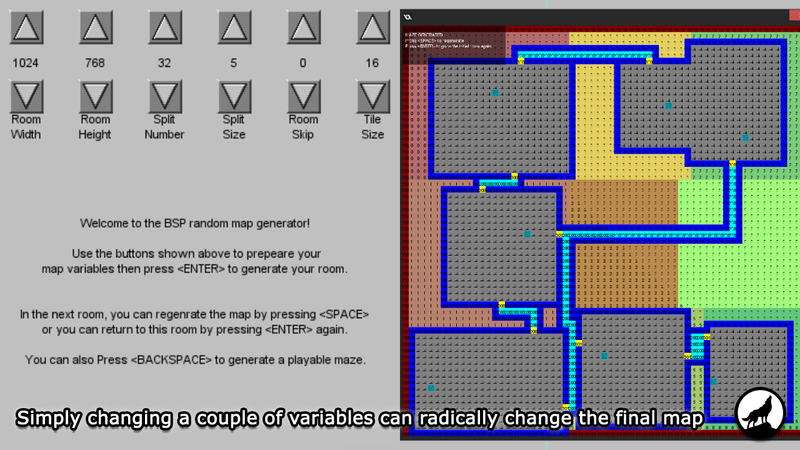 This project contains a set of BSP (Binary Spacial Tree) Maze Generator scripts, which are ideal for procedurally generated games like rogue-likes, adventures, or even Spelunky-style platformers. Accepts any base "tile" resolution. Includes scripts to spawn walls, doors, enemies, potions... whatever you need! BSP stands for Binary Space Partitioning, and it's a method of dividing up an area. 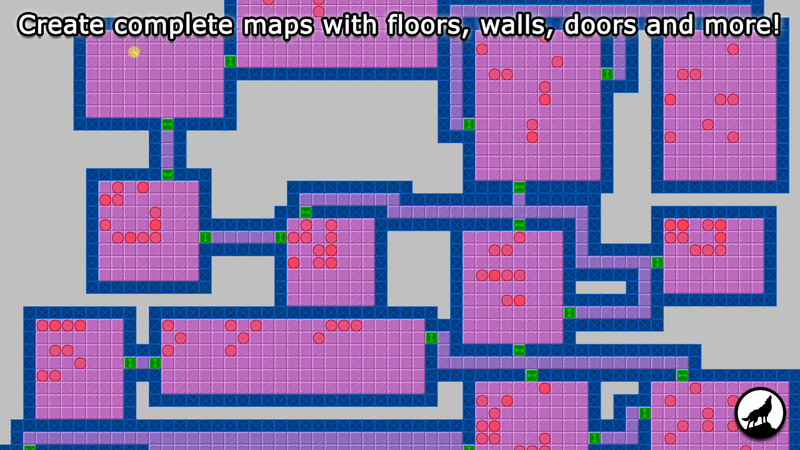 In this case, it's used in a series of scripts that can be used to generate a maze (or map, or dungeon) for any game, complete with rooms, corridors and doors. 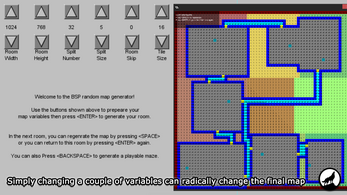 The engine adapts to any room size and base tile size, and it can be adjusted is several ways to get different results each time. 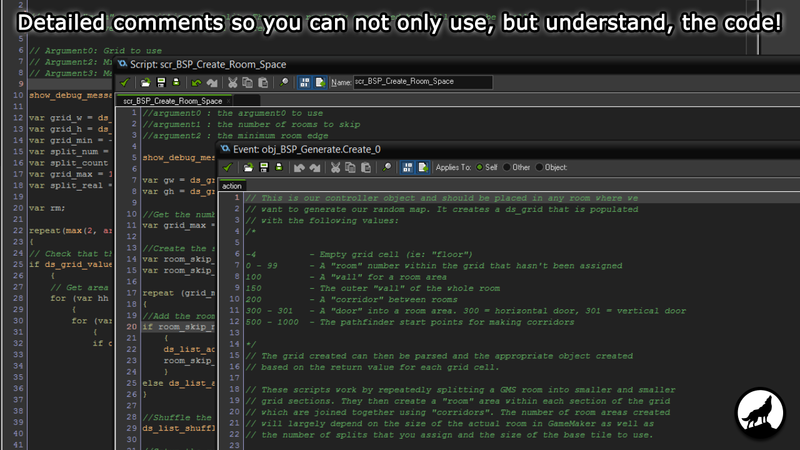 You can also use these scripts (with a minimum of customisation) to add features to your created mazes like enemies, switches, power-ups etc. 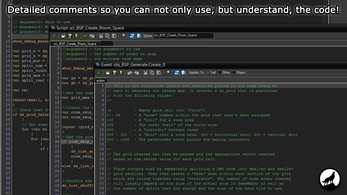 NOTE: While I strived to make these scripts as accessible as possible, you will need to know the GameMaker Language to use them and they are not recommended for absolute beginners. The demo project supplied with these scripts permits you to test the main features of the engine and you can get an idea of how it works in a real game by pressing <Backspace> from the main options room. 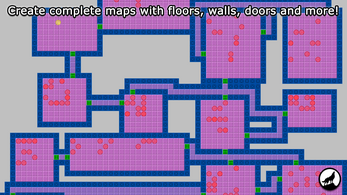 This will create a maze using your set parameters and add a player, walls, doors, floor tiles and some enemies. The full set combined give you a highly optimised and graphically consistent maze/dungeon map for your rogue-like or adventure games.